Forex - What Does It Mean? What is meant by the term "forex"? 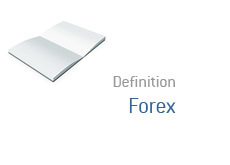 What is the definition of "forex"? "Forex" is short for "foreign exchange", so when you hear the term "forex market", people are actually referring to the "foreign exchange market". The foreign exchange market is a worldwide exchange where currencies are traded virtually all the time. According to the Bank for International Settlements, the average daily turnover in the forex markets is nearly $4 trillion - this is EVERY DAY. Due to the massive amount of volume in the forex markets, there is a tremendous amount of liquidity. The foreign exchange market is by far the most liquid exchange in the world. Individuals, governments, sovereign wealth funds, hedge funds - these are just some of the daily participants in the forex market. Some people are involved in a purely speculative way, trying to guess (and profit from) the direction that a currency might be heading. Many others enter the forex markets to help conduct business and engage in various transactions - for instance, a government may purchase a large amount of US Dollars in order to facilitate the purchase of a commodity that trades in USD. Islamic Forex Accounts - Who Offers Them?